Use science and engineering to transform your bin of LEGO® bricks into amazing, movable toys, machines and gadgets. Bestselling author Sarah Dees is back with an all-new collection of projects featuring ingenious designs and simple scientific principles that real engineers use every day. Make yourself a robot pal whose legs move as he rolls along, or a drummer who really plays the drums. Build a wind-up car complete with a flywheel that’ll send your minifigures zooming. Or challenge your friends to a game of pinball on a LEGO® pinball machine you built from scratch. Each project is cooler than the next! It’s easy and fun to build each of these awesome contraptions and games by following the clear step-by-step instructions and photographs. Think you have a different way to build something? Exercise your inventing muscles and tinker away! You’re in charge of your designs, so experiment and tweak to make your inventions personal to you. No matter what you end up creating, you’ll learn exciting new things about science, impress your family and have a blast along the way. 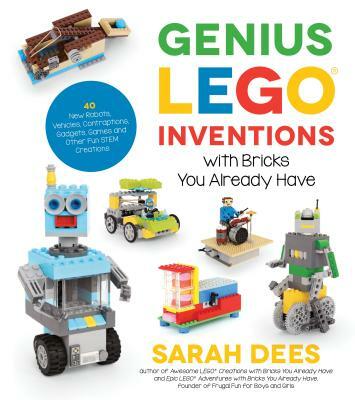 Sarah Dees is the author of Awesome LEGO Creations With Bricks You Already Have and Epic LEGO Adventures with Bricks You Already Have. She’s also the founder of the blog Frugal Fun for Boys and Girls. She and her husband have five children—four sons and a daughter—all of whom love LEGO building together. Sarah and her family live in Fort Worth, Texas.